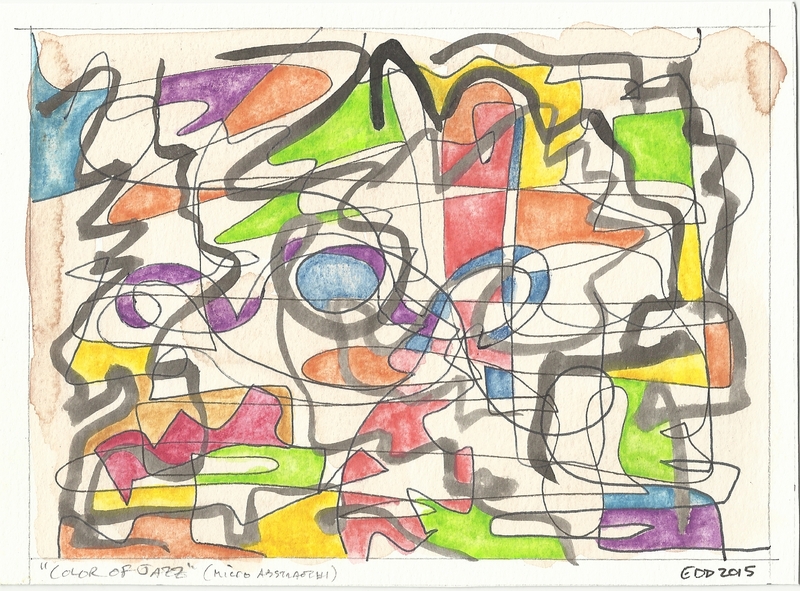 This is a micro-abstract painting, only 5″ x 7″ in size. I really love the colors and shapes in this one. Micro-abstract – not familiar with that term. Because of the size? Yeah it’s just my own little silly category for this one. You’re right because of the size. Thanks for your feedback Laura! Love the term!! And I really love this one…jazz is big here in Kansas City. I think you’ve captured the color perfectly! Charlie thank you so much! I’m a huge jazz fan & have had some fun experiences in KC! Really appreciate your comment. Charlie it would be my privilege to be featured on your blog that’d be amazing! Sounds good Charlie I’m out on the road this morning and afternoon and when I get back to my office I will send you a note. Thanks so much I really appreciate you taking interest in my work! Excellent! Sounds like a plan!! Love this piece, the colors and energy are great. For some reason The Blue Note popped into my head while admiring the design. ‘Micro-abstract’ is great naming for making it your own. Thank you for sharing this. Thank you so very much, I loved reading your comment and insights.